So we had a blast in Michigan- which reminded me that 5 years is far too long to be away from there. I had such a good time- between the fishing, horseback riding, kayaking and more. The best part was catching up with family though. My family had a little cookout in our honor- smoked ribs, turkey, macaroni and potato salads and much more. 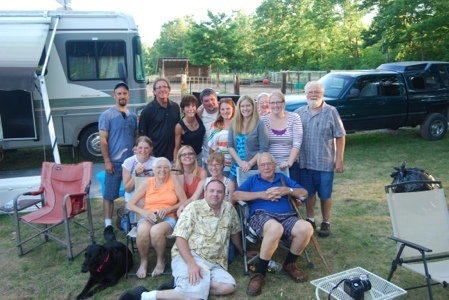 But the best part for me was seeing so much of my dad’s side of the family in one place. Two of his sisters, one brother, his parents, four of my cousins and four of their kids playing with Katelyn and Logan. It was so nice to hear the laughter and hear the many stories as we passed the night away. Before anyone could sneak away, I grabbed this group shot. It’s probably the first I have of that size in over 20 years. I love my family! !